Last night saw weak showery activity in the mountains all night long with two good bands that went through, one around midnight and the other around 4 AM. It added up to be about 9″ in the upper Cottonwoods. The showers continued for the rest of the morning, but snow ratios were so-so in the warm prefrontal air. Around lunchtime the strongest cold front we’ve seen in a while came through Salt Lake City. Many of us at Utah Ski Weather watched it approach from campus, and it was quite the show! Here’s a time lapse from the University of Utah Department of Atmospheric Sciences webcam on the William Browning Building. You can see the front kicking up clouds over the lake for a while, and eventually it moves over the city and the squall whites out the camera. The front brought with it a cooler temperatures, lifting, and a whole lot of graupel. Once it reached the mountains, snow rates and ratios picked up dramatically. It’s been snowing an inch an hour at Alta since noon, and there’s no signs of it stopping for a few more hours. 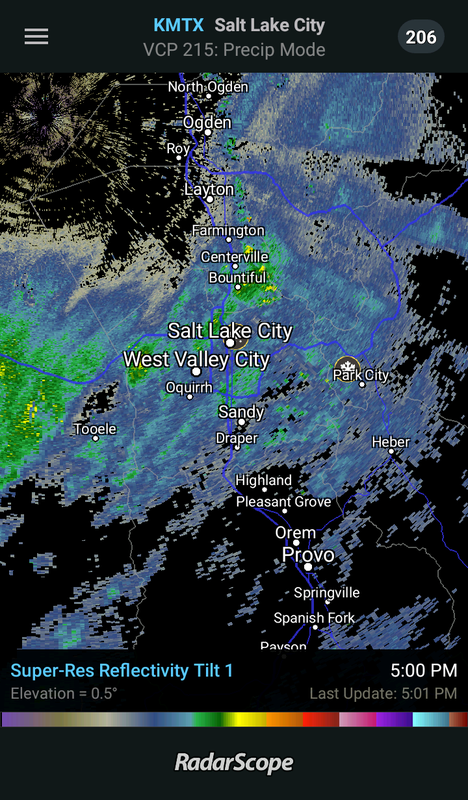 Currently the heaviest snow is north of Salt Lake City and there’s widespread heavy snow west of Tooele (defs don’t recommend driving across the west desert today). In the next few hours we’ll go back to the showery stuff (a lot colder this time though). Overnight will be a quite time, and hopefully the avalanche control crews will be able to get some work done. Currently LCC is scheduled to be closed 6:30 to 8:00 tomorrow morning. The next round of snow starts right around 8 AM, and it’s looking to be a good way to cap off the storm cycle. A stratiform band of precipitation will move through northern Utah from around sunrise to noontime, and the mountains may have snow falling for the rest of the day. There is still uncertainty with this band (where it will be heaviest, what direction the winds will be blowing, etc.) that makes it very tricky to forecast snowfall totals for it, but I’m going to go ahead and say to expect another foot to foot and a half in the upper Cottonwoods. Wednesday night into Thursday there will be lingering showers, and it will be chilly. Temperatures on the slopes could be below 0°F on Thursday, but it will warm up somewhat going into the weekend. Previous Previous post: 100”… and (way) beyond!